A 5.45 wake up call felt like sleeping in as compared to our previous wakeup calls on this quest. This was courtesy of the “late” 9am flight to Louisville. We got off to a great start eating right as breakfast consisted of McDonald’s at the US Airways terminal at LaGuardia. Thank you to all those people who just refused to go to the middle line which was at least seven people shorter than the other lines. After the man in front of us was told that they did not serve Cheerios or lasagna, it was McGriddles all around. A cardiac surgeon on speed dial is not a bad thing. Al had a small scare at the airport as one of the planes on the tarmac near our gate was a prop. But relief came as we were on a 50 seat regional jet that with the way the airlines are headed will be making transatlantic journeys real soon. Our flight and arrival in Louisville was uneventful, which is the best thing that you can say about any airline travel. Before this trip, Al presented me with two gifts; a college football quest hat and a college football quest tee shirt. He had them made up as a trial of different promotional things we could do. Due to my increasing heft and the fact that the shirt was a medium, only Al was wearing his. But it paid off right away as we could tell people were looking at the shirt immediately upon our arrival at the Louisville airport. We picked up the rental car from a very sneaky Dollar Rent A Car agent. After having a discussion about the vagaries of Kentucky rental car law and that we would lose our homes if anything happened to the car, we declined coverage and headed out to the car, a Dodge Nitro. The Hot Brown is an exquisite tower of roasted turkey, mornay sauce, parmesan, bacon, and two lonesome tomatoes. The mornay sauce was divine but if I had one bone to pick, it was that the turkey did not taste like fresh turkey. It tasted and had the consistency of processed turkey. If true, it is a national or at least Louisville disgrace. If false, they should use a higher quality of turkey. The Derby Pie is a cannot miss item and no meal is complete without at least one bite of this heavenly pastry. It is served elegantly plated on a dish. This is an open sandwich so a knife and fork are a must. A napkin made of the finest linen is also available should one want to avail themselves of such things. In my career reviewing restaurants for such fine papers as the Waldo Gazette and Starke Prison Times, I have never understood why an open face sandwich is a sandwich. In my professional opinion, a sandwich must have two pieces of bread. This reviewer likes finding the out of the way hidden gems and the Hot Brown at the Brown Hotel is one of those rare finds. I suggest that you drop what you are doing and head to Louisville for the Hot Brown before the national media discovers this gem and blows my secret out of the water. After the Hot Brown, it was off to the Louisville Slugger museum and factory. 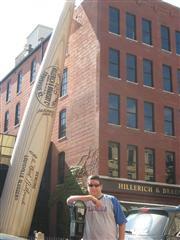 We were able to locate the World’s Biggest Baseball Bat which coincidentally enough was right next to the museum. After much debate between Beth and me via mobile telephone, it was decided to purchase souvenir bats with their name engraved on it for my kids. Not sure if giving my son a baseball bat is a wise idea, but then I thought “When am I going to make it back to Louisville?” Bad Idea Jeans. 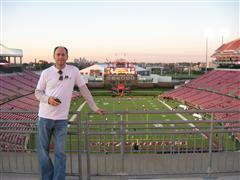 After spending some money assisting the Louisville economy, we headed to the University of Louisville. As an aside, Louisville has an awful lot of tunnels. It may be because of all the trains, but it leads to some very interesting signage about not driving into a tunnel filled with water. They actually measure the depth of the water in the tunnels with giant rulers painted onto the sides of tunnels. Al’s first thought was that the University of Louisville and the University of Cincinnati were built by the same person. Al does not know which was built first, but whichever was built second should have gotten a good discount on design and supplies. Interestingly enough, I could actually see where he is coming from on this one. Strange thing are afoot at the Circle K.
>The campus maps were oriented differently at each location. This made it quite confusing from map to map. >There is a very ugly Greek building that looks like a prison. I do not know if that is a commentary on Greek life or an architectural design. I should ask the question, where are all the students? We were walking around mid afternoon, on a Friday, with a football game that night and the campus seemed deserted. Where are all the people? I will go very negative here and state that Louisville has the worst bookstore we have encountered. The merchandise selection was very poor. There was not a football jersey of any size in any gender to be had anywhere. I think school administration should look very closely at finding another company to run the bookstore. I will now switch gears and pay a compliment. The athletic facilities on this campus appeared outstanding. It felt like there were ball fields everywhere and of a high quality, at least from a distance. In walking around, we stumbled upon a field hockey game. It was only half time, so we figured we would watch the second half. The game was Louisville versus Providence. It was at this point that we realized there were some Providence parents that were on our flight earlier. I now have a greater appreciation for what it is like for someone who does not know the rules of football to try to watch a game. This was field hockey and we could not figure out the rules. Clearly the intent of the game is clear. But what is a foul, a corner, a penalty corner, substitutions on the fly, made very little sense. Luckily my wife played field hockey in her youth. A call to her got nowhere as she had no idea what the rules were. I think she was just blowing me off because how do you not know the rules to a game you played as an adolescent. Sadly, my wife’s field hockey career was cut short by the scalpel of a surgeon. Louisville went on to win 6-0. 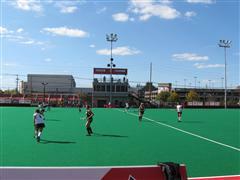 Apparently, Louisville is very good at field hockey which some championship banners at the field confirm. Al would like to note this was personally one of the most frustrating sporting events personally for him EVER. He almost had to leave. He couldn’t take not knowing the rules as it just seemed so ridiculous. After a brief respite at the Country Inn & Suites it was time to head to the stadium for pre game festivities. The first thing we noticed was that Louisville has a lot of cheerleaders. This may have been why we did not see any students on campus earlier. Every student is a cheerleader and thus was getting ready for the game. This is a slight exaggeration, but only slightly. And what nice outfits they wore. We watched the Card Walk. Note to Coach Strong, you might want to shorten the Card Walk. Of all the walks we have seen (this was the first), yours seemed like the longest. You do not want to tire out your team before the game. But that being said, this was a great team entrance. We then wandered around the tailgates. Where are all the people? Papa John’s holds 55,000. The tailgate looked like it had 10 people. There were no RV’s or large tailgates. It was a Friday, but that is not an excuse. We would subsequently learn that a lot of tailgating takes place at the old stadium and then people walk over because parking is free there. In any event we did not see much tailgating. We did however see the Tailgating Cabooses. This is a great idea and it looked like there was a lot of fun to be had as they were essentially permanently fixed tailgating venues. I have subsequently learned that the caboose idea originated at South Carolina, but being smart is knowing what to steal and this was a good idea. We made our way into the stadium early as thanks to the very nice hospitality shown to us by the Louisville athletic department, we were seated in the press box for this game. After getting acclimated, we went on a walking tour of the stadium. Papa John’s is not a very large stadium at 55,000. But it is very nice. The school boasts that it is the only college football stadium in the country with all chair back seats. In walking around, you definitely know that you are not in a 100,000+ stadium, but that can be both good and bad. They have a Dippin’ Dots stand. Is that still the ice cream of the future or has that ship sailed without them? They also serve hard liquor at the concession stands. Nice! Overall, this is a very impressive venue. It is clean, comfortable and as I will mention shortly very loud. We made our way back to our seats in the press box for the game. The press box, coach’s rooms, etc were all very impressive and very comfortable. Except for the time Al called Ray Lucas “Don McPherson”. That was uncomfortable and he apologizes to both. Interestingly, the press box does not serve Papa John’s pizza. As game time approached, we kept wondering…where are all the people? In looking at pre game stats, I noted that both Louisville and Rutgers were in the top 20 in defense and both ranked over 100 in offense. In my reverse football logic, that normally signals a high scoring game. Rutgers came in atop the Big East, while Louisville was 2-4. Al and I both picked Rutgers. After a very nice pre game introduction, kickoff time came. Rutgers received the kickoff and opened the game with a nice 19 yard pass. Three plays later Louisville intercepts. It was at this point we looked around and seemingly out of nowhere, there were people. Lots of them. I thought attendance would be 15,000. Instead it was 48,000. Not at capacity, but still a lot more than it appeared there would be 15 minutes ago. In addition, they were loud. When the ball was intercepted, a roar took over the stadium. We would go out onto the photographers deck so that we were outside with the crowd and it was very loud. This was not the loudest stadium we have been in (which was probably Penn State), but for the size of the venue, this was pound for pound, the loudest. Much credit to the Cardinals fans, you guys sure know how to make it loud. Louisville would do nothing with its possession and then Rutgers would throw another interception on its second drive. Louisville would not miss this opportunity and they would take four plays to get the first touchdown of the game, 7-0 Louisville. Interesting observation…the press box televisions are on a seven (or so) second delay so you can watch the play on the field and then see it again on tv. Great idea. Rutgers would miss two field goals in the second quarter before blocking a punt two minutes before half time. This gave Rutgers the ball on the Louisville 26. Six plays later, we were at half time of a 7-7 game. So much for the offensive game I had predicted. Louisville had 3 first downs in the fist half and they were tied. Louisville received the opening kick of the second half and took it 7 plays for a go ahead field goal. After a Rutgers punt, Louisville blew the game open with a 7 play drive for a touchdown going ahead 16-7 (they missed the PAT). To answer, Rutgers went on the drive of the game, a 14 play 80 yard drive for a touchdown consuming 7 minutes of game time, to make it a one score game at 16-14. Rutgers would never get past midfield again. But they missed a golden opportunity to take the lead as Mark Harrison dropped a sure touchdown on a deep ball with the nearest defender being 15 yards away. Louisville earns the 16-14 victory, as Al misses a chance to gain ground in our game picking contest. Best wishes go out to Anthony Cooper who broke his neck during the second quarter. Thankfully, he is not paralyzed but he has a long road to recovery and our best wishes go out to him and his family for a complete recovery. To wrap up the game, it was not a pretty game but it was a hard earned victory for Louisville. The stadium was a great atmosphere to see a game. It is a very nice stadium that can get absurdly loud. Congrats to Coach Strong who previously coached at Florida and long deserved a chance to be a Head Coach. 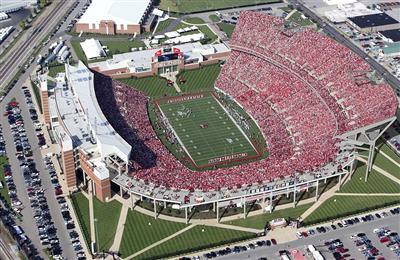 I am glad that he has found a home at Louisville signing a 7 year contract extension before the game. After the game, we watched Coach Strong’s press conference (very cool) and then walked back to the hotel to get some dinner. Of course, it being 1:30 am, our only option was Arby’s. Major lost business opportunity for local restaurants to stay open late for the after game crowd. The next day it was an early wake up call. For once the early wake up was not due to a flight, but our wanting to go to breakfast before leaving Louisville and going to Western Kentucky. Of course what trip is complete without the kicking of the field goals? We walked right onto the field at Papa John’s and Al proceeded to go 0 for 2 in kicking 30 yard field goals. Yes, Al has eligibility for all those schools in need of a god awful field goal kicker. It was then off to Lynn’s Paradise Café which has been featured on numerous travel channel, food network, discovery network shows as well as national television and numerous newspapers. Needless to say, it has received national notoriety. Our pre trip research indicated that this was the place to have breakfast. Breakfast was fantastic. This was one of the best meals of the quest. My French toast was probably the second best French toast I have ever had (number one is Tonga Toast at the Polynesian Hotel in Disney World). Additionally, the atmosphere is vibrant and they have a lot of nice extras like asking if you want coffee or water to go as you leave. I would definitely make a stop here if you are ever in Louisville. After stopping back at the Louisville Slugger museum, it was on the road to Bowling Green, Kentucky. The trip log continues in the Western Kentucky write up. In closing, we want to reiterate our thanks to the University of Louisville athletic department and media relations for the generous hospitality shown to us during our visit. 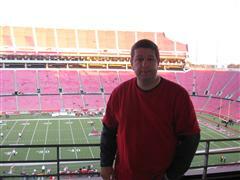 Rutgers finished the year with a win over Iowa State in the Pinstripe Bowl, played at Yankee Stadium, to finish at 9-4. Although the 9-4 record is slightly misleading as the Scarlet Knights were only 4-3 in Big East play. Louisville entered the Rutgers game 2-4, but finished the year 5-1 before losing to NC State in the Belk Bowl to finish the season 7-6. Louisville earned a share of the Big East title with a 5-2 conference record, but it would be West Virginia winning the three way tie to represent the Big East in the Orange Bowl.